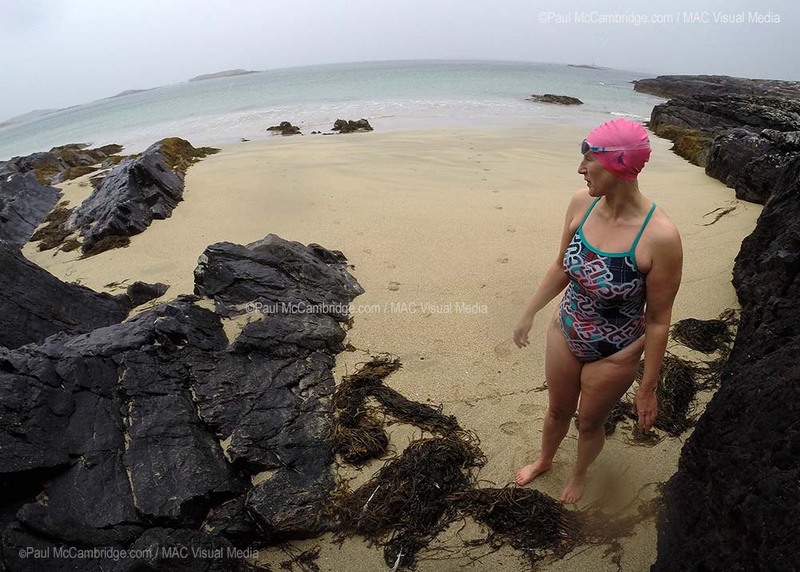 Traveling along the coastline of Ireland I have been welcomed by swimmers young and old in the ever-changing weather, the common thread between us all; a sense of play and having fun in the outdoors. Following the coastal roads there are many single track, rough lanes leading down to the shore. One such lane brought me to a chance meeting with a gentle man on an almost private beach. The track ended with just enough space to turn a car and a flat grassy area surrounded with tall bracken, a superb place to pitch our tents on this late summer evening. As the air cooled and the sky darkened we settled down to have a hot dinner and a cool cider. As the early morning sunshine lit up the tent walls I could hear the stirrings of the others as they rose. Without enough strength yet in the morning sun to warm the air I pulled on my fleece and prepared to greet the day. Zipping open the tent there was an excited; “You just missed the funniest sight!” and as Darragh related to me our new friend’s dramatic entrance to our little ring of tents, pitched as we were at his favourite early morning bathing spot, Paul came charging to his car for camera lenses then sprinted back over the grass towards the sea to record this impromptu introduction to John’s morning ritual. The sun glinted silver on the water as he happily extolled the virtues of “free-swimming” while drifting back and forth and the tide gently filled the bay, his Jack Russell terriers scoured the rocks on the shore, chasing the varied scents and every so often lifting their heads to check on their beloved master. “Do you know, September is a great time of the year for ladies to swim in the sea?” he told me. “The sea-weed releases its nutrients into the water. It’s good for the skin, you can bathe in the true fountain of youth and it won’t cost you a penny!”… He invited me to join him, I declined but Darragh decided it was time for his morning bath and so launched himself in…modestly clad. Wrapped safely in his towel and with a disarmingly good-humoured manner, he quoted some Seamus Heaney and cited the feel-good benefits of sea swimming. Over a warming cup of tea after his swim John told me that, when he saw our campsite he had almost turned away and left but then said to himself, “Feck’em! This is my beach! I come here every day, if they don’t like it, tough!” and so he had carried on, striding boldly through our little campsite, towel slung over his shoulder, cap and goggles on and nothing else… to swim as nature intended. Since retiring he has given up alcohol, eats only fruit for breakfast and enjoys a simple life; his ritual sunrise dip in the sea every morning from early spring right through into autumn, while the dogs investigate the rocks, impatiently waiting as he dresses to then take a warming walk along the shore. Later, he might meet up with friends for lunch or go home and read; poetry his favourite. Feeling healthier than ever, he has contentedly exited the rat race and found these simple pleasures perfectly fulfilling. I left this new friend with a renewed sense of the beauty of outdoor swimming, so many people, from so many different walks of life sharing a common love. No matter where one goes, when one meets a swimmer there is no difficulty in conversation. I have been stunned by the raw beauty of Connemara, the lake dotted peat bogs and the myriad beaches from stone, to shell, to fine white sand and now, travelling towards Killary Harbour the mountains soar up. Rugged green banks rise from the roadside and I want to jump out of the car and stride into the hills despite the driving rain, horizontal and beating its way through any gap in my armour. The narrow winding roads take me past new houses, old cottages and tiny fisherman’s hides, some made from metal and some looking like miniature white-washed stone cottages. 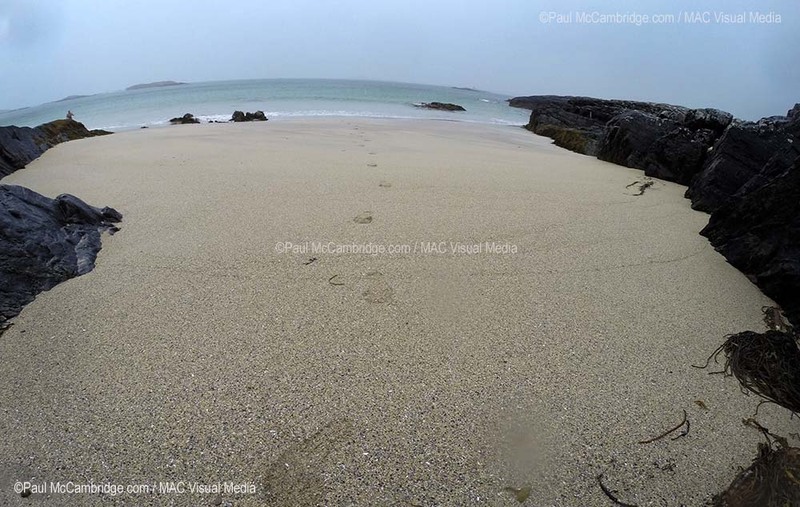 On the Atlantic coast and near the mouth of Killary Harbour, Glassilaun Beach does not disappoint, breath-taking even on a grey and windy, rain-swept day, soft pale sand sweeps round in a gentle arc towards a small island with a second small beach. On a warm and sunny day I would swim from here across to that beach and lie in the sunshine. I would walk on the grass-topped island and look out across the North Atlantic, bring a picnic, and while away the day. Today though, there would not be any sun-lounging, the dry bag was needed to store clothes and towels against the rain as we ran across the sand and into the water – all set to squeal at the chill but no, the water was pleasant. A shoal of the tiniest jelly-fish I have ever seen, our only company. Swaying back and forth with the outgoing tide, little button mushrooms, some smaller than my baby toe-nail, they hadn’t the strength to sting. 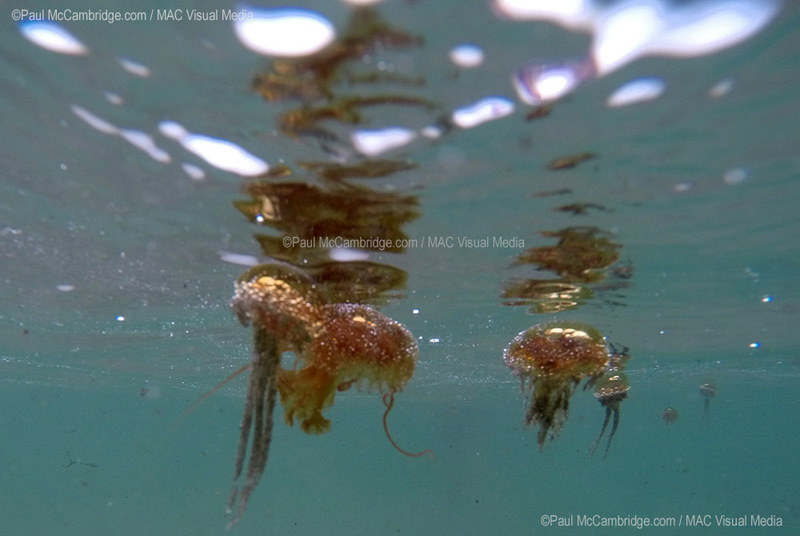 We left the colony and swam on towards the island, while the gentle Atlantic swell softly brushed the shoreline. Glassilaun Beach is one of a number of Blueway Beaches and as such has car-parking and good information boards. Take the N59 from Leenaun and follow the Connemara Loop past Lough Fee, sign posts then for Glassilaun and Scuba Dive West guide you to the beach and parking – no facilities. Killary Harbour is a glacial FJARD, similar to a FJORD, only shorter, shallower and broader. At 16km long and over 45metres deep it is one of three Fjards in Ireland; Belfast and Carlingford Loughs being the others.